Learn more about security threat management. Security Threat Management: Is the small and medium enterprise keeping up? Download your free copy of this research report now. To survive in today's fast-paced, hyper-responsive business environment, SMEs must be lean and agile from both a human and a technological standpoint. Budgets are tight and headcounts are even tighter. This led us to ask, How are SMEs managing security threats, despite these constraints? To answer this question, we surveyed IT professionals and others supporting the IT function within SMEs across multiple industries. 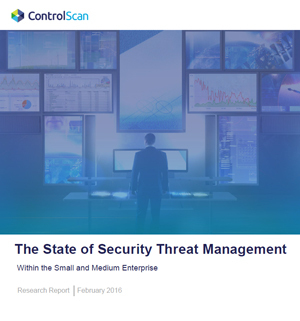 The results of the ControlScan State of Security Threat Management survey are now available within a comprehensive research report. Discover why IT Pros are not confident they can detect intruders or malware in their network. How IT teams can effectively prioritize—and at the same time overcome budgetary and resource constraints—to better protect the SMEs they support.